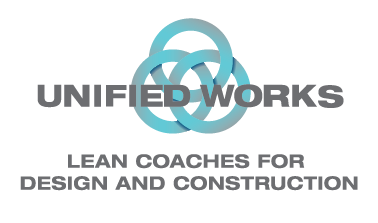 Unified Works, Inc. is a lean coach for the construction industry, specializing in building better teams that build better buildings. We train and guide owners, designers, contractors, and vendors—making sure every effort counts toward efficient completion of the project. Our job is to build teams that get work done right the first time. Period. Lean Construction applies the principles and practices developed for efficiency in manufacturing and other industries to the management of construction projects. Our workflow tools are specifically designed for the complex interactions inherent in large construction jobs, fostering communication, understanding, and respect among all team members. “Make work ready, because readiness wins.” When everyone is focused on handing off work and information, the project can progress without the conflicts and workflow interruptions that lead to delays and extra costs. Lean focuses on two key pillars: eliminating waste and adding value. It’s rooted in openness, respect, and accountability. In practice, lean construction focuses everyone on the fundamentals of integrated performance. All stakeholders—the general contractor, suppliers, trades, designers, and the end customer—truly collaborate on planning and controlling production. And all commit to it—with posted promises and a tactical understanding of how their part depends on others, and who is depending on them. Everyone involved in the project is accountable to everyone else—their responsibility is successful completion of the project, not just their isolated task. Lean construction isn’t rocket science – but it’s not easy either. It takes coached repetitions and complete commitment to the platform. The method is the goal: continuous improvement and respect for all team members, while striving to do work right the first time. Our focus is on changing culture and how we build and lead teams of people, not just projects. Pull planning starts with all team members developing project milestones together. There are tasks on a timeline, as with conventional planning, but these are linked through networks of responsibilities. Everyone on the team contributes and signs off on the details of work tasks, information flow, and material deliveries. Pull planning emphasizes, above all, the flow of information. Continuous communication is a key responsibility for all team members. Everyone knows what other team members need from them, and when they need it. Thank you for your efforts at LCI Congress! After another successful year, LCI and the 2018 LCI Congress planning team are pleased our attendees found such value in the event’s content. Based on evaluation data collected from course participants, your instruction received an average score of 4.96, on a scale of 1-5. We create unprecedented collaboration by organizing the project around a team-based, pull planning process. We teach a system that rapidly unifies temporary teams into high performing units—coaching all participants through collaborative planning and scheduling of work. We focus on strengthening trust, commitments, and relationships, by emphasizing communication throughout each phase of the work. We make everyone’s job safer by making workflow more predictable, with fewer execution problems. We identify and remove constraints by planning delivery of information—not just people and materials. Participants know how their work relates to every facet of the project. We get quick “buy-in” from the trades and other field personnel. All team members are actively involved in planning up through the highest levels. We roll up our sleeves and dig in to every detail of the project. We have more fun and self-fulfillment. We cost less and provide more–we’re a lean enterprise ourselves. Thank you for presenting Lean Construction concepts to my Purdue Construction Engineers. Your program was very well received, and was one of the highest rated sessions in the semester. Your enthusiasm and commitment to Lean Concepts made the class exciting and informative. You did a wonderful job of explaining the Lean strategy and its importance to the construction industry.